Excellent for use in off-grid applications such as remote telemetry, battery charging, recreational vehicles, oil and gas, solar water pumping, and solar lighting. Our private line of high-quality off-grid modules. 25 year power output warranty. 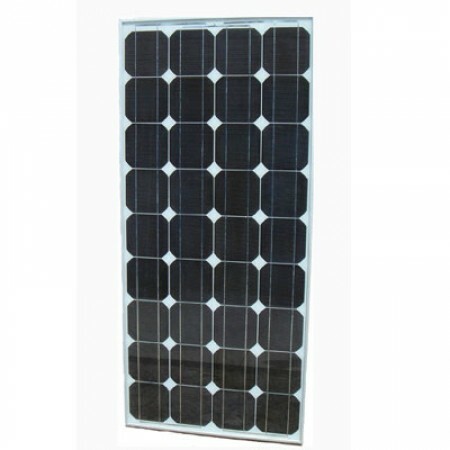 Mono-crystalline cells for optimal energy production in all solar conditions. Tempered glass and anodized aluminum alloy frame for long service life. Dimensions (Inches) (L x W x H) 46.6" x 21.4" x 1.37"
5 years at 95% of the minimal rated power output. 10 years at 90% of the minimal rated power output. 18 years at 85% of the minimal rated power output. 25 years at 80% of the minimal rated power output. Usually can ship standard carrier (UPS/FedEx). However, for pallet quantity, must ship truck freight. Call for pallet quantity freight quote. Please contact us if you have any questions, or if there is no shipping weight noted for a shipping cost quote. Prices online subject to change without notice due to manufacturer price increases. We will contact you if current price or shipping is more than the online price prior to processing the order.